What Motivates You to Walk or Bike to Work? It’s tough trying to stay active while juggling work and home responsibilities. Who has the time or energy to squeeze in a gym workout after sitting through bumper to bumper traffic for an hour? Click here for our top 10 reasons why you should get outside and walk or bike to work (at least once a week). Having car trouble? Out of gas? Flat tire? Call 511! Drivers stranded on freeways in the San Diego region can dial 511 from a cell phone for FREE roadside assistance. SANDAG, in partnership with Caltrans and CHP, operates a Freeway Service Patrol (FSP) that provides free roadside assistance to drivers stranded along approximately 222 miles of local freeways in San Diego County. The FSP operates Monday through Friday from 5:30 – 9:30 a.m. and 2:30 – 6:30 p.m., except on Federal holidays. With SB1 funding, a pilot program will expand hours to midday and weekend service. Midday service from 10-2 on weekdays will start on July 1, and weekend service from 10 – 6 will start on August 1. For help, simply call 511 and say, “Roadside Assistance”. FSP tow or pickup trucks are white with the statewide FSP logo on the door. Drivers wear blue uniforms and yellow safety vests and are not allowed to accept tips or payment. For more information, please visit 511sd.com/aid. Did you have a positive experience with one of our FSP drivers? Email us to let us know! Call 511 from any phone to be also connected toll-free to public transportation, traffic conditions, iCommute, FasTrak®, Compass Card, and a Spanish menu. ConstructionTerm Highlight: Retaining walls are rigid structures designed to restrain soil to a desired slope that it would not naturally keep to. Various types of retaining walls are currently being constructed in the La Jolla Colony Drive area, including cast-in-place, soil nail, MSE, and soldier pile. Different wall types are used depending on many factors including soil type, protecting utilities, and supporting roadways among others. 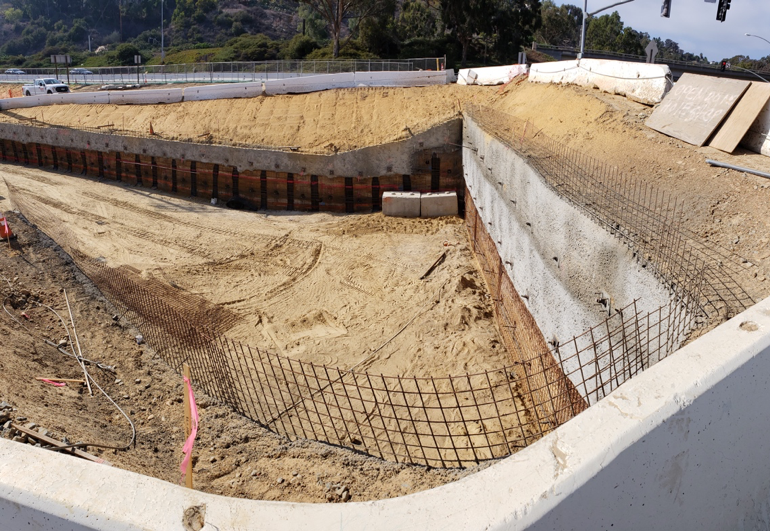 The future cut-and-cover tunnel at La Jolla Colony Drive will be constructed with cast-in-place walls under the roadway and various other types will be used leading into and away from the roadway area. The Mid-Coast Trolley construction is continuing along the Genesee Avenue at several intersections. Girder construction along Genesee Avenue, north of La Jolla Village Drive will continue through January 2019. View closure updates at KeepSanDiegoMoving.com/MidCoastTrolley, Facebook.com/MidCoastTrolley, or @ShiftSanDiego on Twitter. The Mid-Coast Trolley construction at the La Jolla Village Drive and Genesee Avenue intersection as of November 2018. Preparations for the Farmers Insurance Open began in early October with a wall-to-wall overseeding process of perennial ryegrass on both the North Course and the South Course. 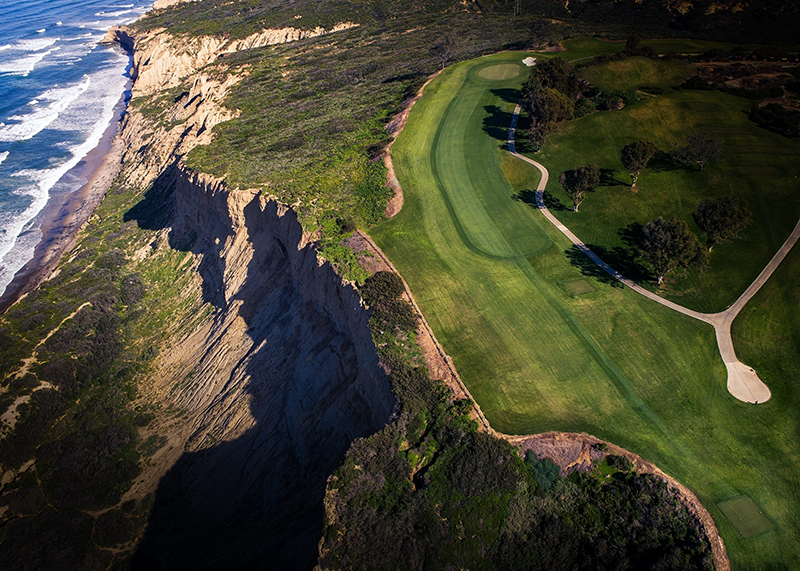 Each of these award-winning layouts play host to San Diego’s PGA TOUR stop. The buildout for the event itself began on November 1, 2018, with the building of grandstands, hospitality tents and television towers across the two golf courses. Immediately following the event taking place Jan. 24-27, a South Course remodel is slated to begin in February 2019. This will include a new irrigation system, improved bunker infrastructure and improved turf on approaches. In addition, two holes will undergo a minor transformation to improve shot values that both San Diego residents, visitors and TOUR players alike can all enjoy. The City of San Diego Parks and Recreation Department is proud to improve its flagship golf property for everyone. held from Jan. 23-27, 2019. The falsework – temporary support structures used during construction– for the Gilman Drive Bridge were removed in early November, revealing the bridge’s form for the first time since the project started in 2016. The finishing work, including sand blasting and patching blemishes, is anticipated to be completed in early 2019. Once open, there will be striping, sidewalks and crosswalk improvements as part of the Medical Center Drive South Improvement Project. 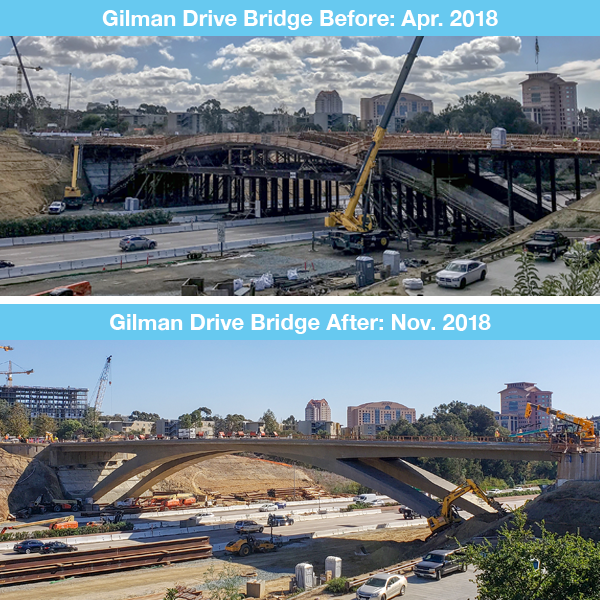 Before-and-After: The Gilman Drive Bridge form is revealed in early November 2018. Phase 7 construction at the northernmost point of Gilman Drive before the La Jolla Village Drive overpass was completed in November. The final overlay and striping of Gilman Drive is scheduled to occur between the end of UC San Diego’s Fall Quarter on Dec. 17 through the beginning of Winter Quarter on Wednesday, Jan. 3. 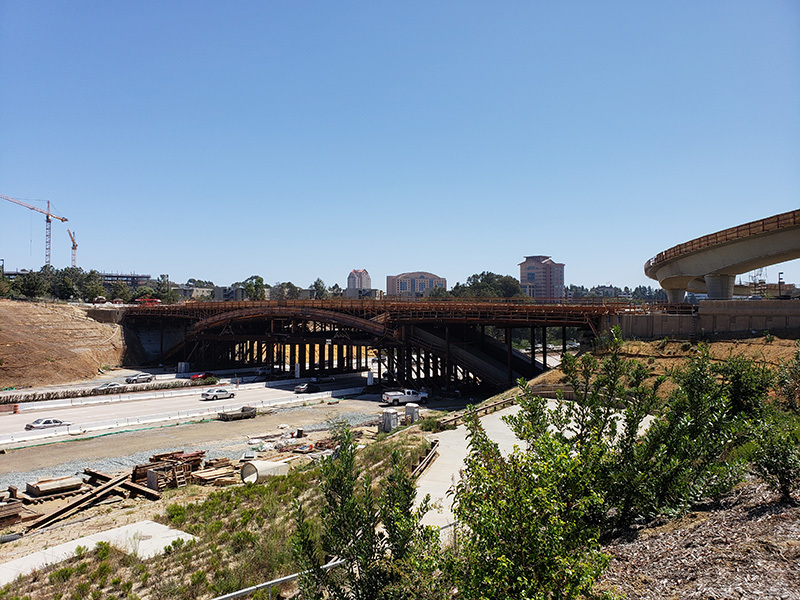 The Mesa Housing Pedestrian and Bike Bridge Project consists of a new bridge across a canyon on the UC San Diego Campus to directly link the Mesa Graduate Housing neighborhood with the Medical Center campus. The bridge will allow walking and biking with significantly shorter, safer routes to campus using the new Gilman Drive Bridge. Let us know what projects you’re most interested in receiving information about via email at info@ShiftSanDiego.com or phone at 1-844-SHIFT-SD. Visit ShiftSanDiego.com to sign up for email alerts about major construction updates and access the map of all the ongoing projects. Have you ever wondered how much time and money you spend on your daily commute? You don’t have to be a mathlete to figure it out, just use the iCommute Commute Calculator! It’s easy and results are immediate. Check out these 7 tips to improve your commute. Figure out how many days per month you commute. Twenty-one days is a typical number for full-time employees. Calculate how many days you drive alone and then separately how many days you commute by an alternative mode . Add up how far your round-trip commute to work is. A round-trip is the total amount of miles when you go to and from work. Using Google Maps is the easiest way to see how far your route is. Just type in your to and from addresses and multiply by two for your round-trip miles. You can easily compare gas station prices near you by typing in “gas” in the search bar of Google Maps, either on your phone or desktop. Google automatically shows you a list of the prices of gas stations near you. View your daily, monthly, and yearly commute costs. Fill out the simple questions on the iCommute Commute Calculator. This is an excellent tool to use when establishing a budget and doing taxes! Gas can get pricey! Especially in California. Cut down your costs with iCommute’s variety of alternative commuting choices like carpool, vanpool, bike, walk and transit. Filling out the Commute Calculator shows how much you would pay daily, monthly and yearly for each different transit option. Ask your coworkers and friends if they’d want to carpool. Even one day a week cuts costs! Having trouble finding someone? Waze Carpool on the App Store or Google Play can easily match you with people also looking to carpool. Some employers offer an incentive for carpoolers! iCommute makes it easy to find a vanpool that works with your commute. Plus, you can earn financial incentives through a vanpool subsidy provided by SANDAG. You can even start your own vanpool! Get your fingers calculating and get yourself into a new commute. Even changing your commute a of couple times a week can make a big difference for your pocketbook, the environment and your overall health & wellbeing. Knowing what you know now about the cost of your commute, what type of change will you try for getting to work? Here area few tips to make your commute more enjoyable, relaxing, and cost effective. Read on to learn more! Get to the transit stop five to ten minutes before your scheduled departure time to make sure you don’t miss your ride . When riding the bus, pick the right spot. Check that you are on the correct side of the street and stand up as the bus approaches to signal that you are ready to be picked up. If you’re paying with cash, have exact change when riding the bus. Drivers don’t carry change. You can easily get a Compass Card or download Compass Cloud from the app to make payment easier. Just call 511 and say “Compass” to get more information. When riding the Trolley or COASTER, you must purchase a ticket before boarding. There are ticket vending machines at each station where you can pay by cash, card, or reload a Compass Card. You can also pay for your pass with the Compass Cloud app on your mobile device. All routes are wheelchair accessible. Bikes are allowed on buses (two per bus) as well as the COASTER, SPRINTER, and all Trolley lines. Learn how to bring your bike onto MTS and NCTD. Be cautious in traffic; drivers and other motorists may not see you. Don’t run across the street for a bus and never run in front of a bus. Choose a safe location. If possible, wait at a well-lit bus stop or one with other passengers and pedestrians nearby. In the event of an emergency, a bus driver can radio the control office for help from first responders. If you need assistance or witness an emergency, ask your operator for help. Don’t block the aisle with strollers or other objects. Occupy only one seat; place bags or parcels near your feet or on your lap. Offer seating to elderly or disabled riders if you are in good health. Avoid loud conversations, music, cell phone calls, and foul language. Stay clear of all walkways and door areas. Avoid eating or drinking on board. Be considerate of future riders and don’t deface the vehicle with graffiti, trash, or anything else that does not belong. Be mindful of which stop you need to get off at and aware of which stop comes before. Take all your belongings when you leave, including newspapers and trash. Double check you have your phone, wallet, and keys! Exit through the rear doors to allow passengers getting on board to use the front door. Whether you are new to transit or an existing transit commuter, these are great tips to keep in mind when you travel by bus, trolley or train. Construction Term: Soil nailing is a technique used to reinforce and strengthen existing ground. Soil nailing consists of installing closely spaced bars into a slope or excavation as the construction proceeds from top down. For the work related to the Torrey Pines Slope Stabilization Project, 40-foot long soil nails and water tie-ins are being installed into the retaining wall. The Mid-Coast Trolley construction is continuing along the Genesee Avenue at several intersections. 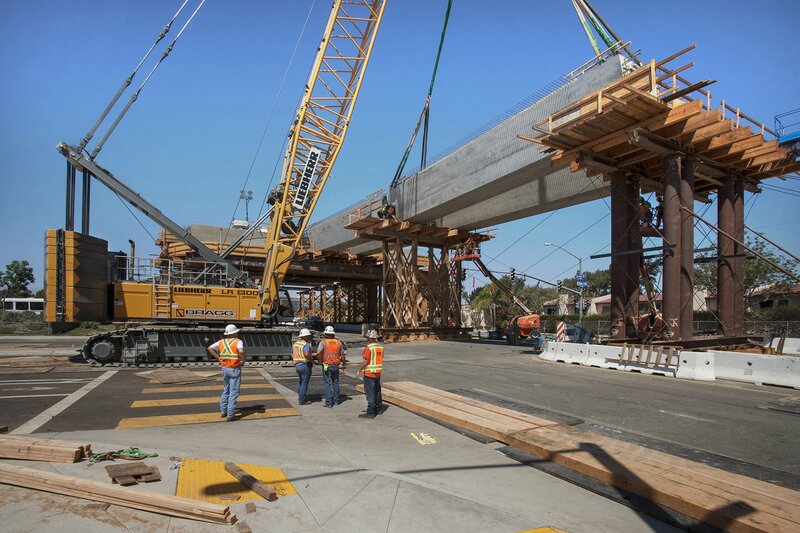 Girder construction along Genesee Avenue, north of La Jolla Village Drive will continue through the end of the year. The Mid-Coast Trolley construction continues along Genesee Avenue. 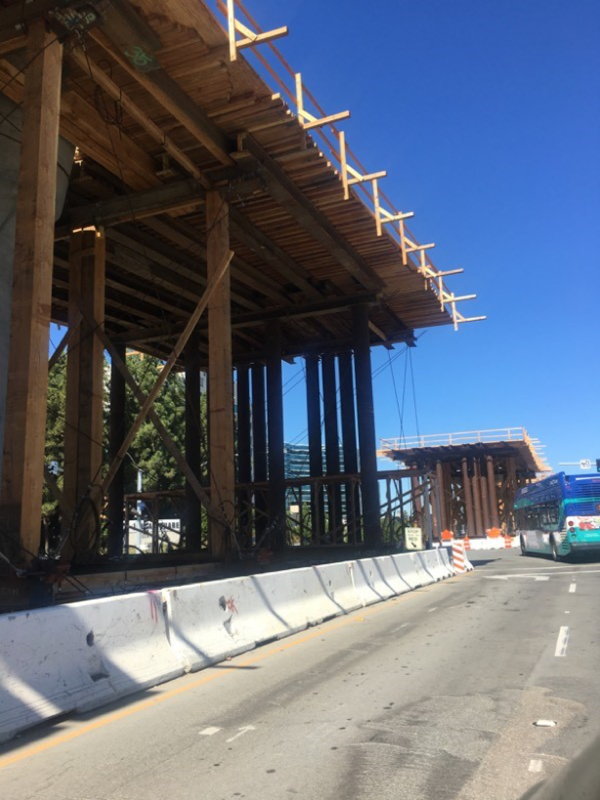 Falsework, the temporary support structures used during construction, for the Gilman Drive Bridge is tentatively planned for complete removal in October. This effort will reveal the bridge’s form for the first time since work began in November 2016. Visit KeepSanDiegoMoving.com/GilmanDrive to learn more about the Gilman Drive Bridge project. The Gilman Drive Bridge with falsework still intact. Soil excavation and utility work is expected to be complete by the end of November. Concrete trucks will enter campus from North Torrey Pines Road and Muir College Drive. They will exit the campus from North Torrey Pines and La Jolla Shores Drive. Buildings structures are expected to be built from June to December 2019, and the student-ready housing is estimated to be complete by Fall 2020. The Torrey Pines Living and Learning Neighborhood is under construction. 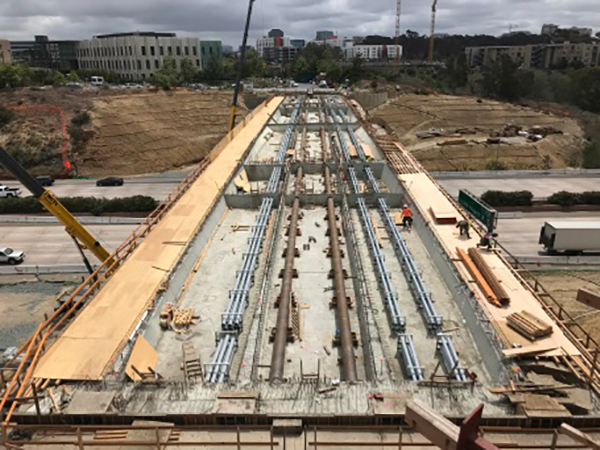 Work for the project has included connecting a water line to the existing main line on Torrey Pines Road and installing 40-foot long soil nails and water tie-ins into the retaining wall. Grinding and overlaying road work is tentatively scheduled in November, followed by the construction of a stamped asphalt median. 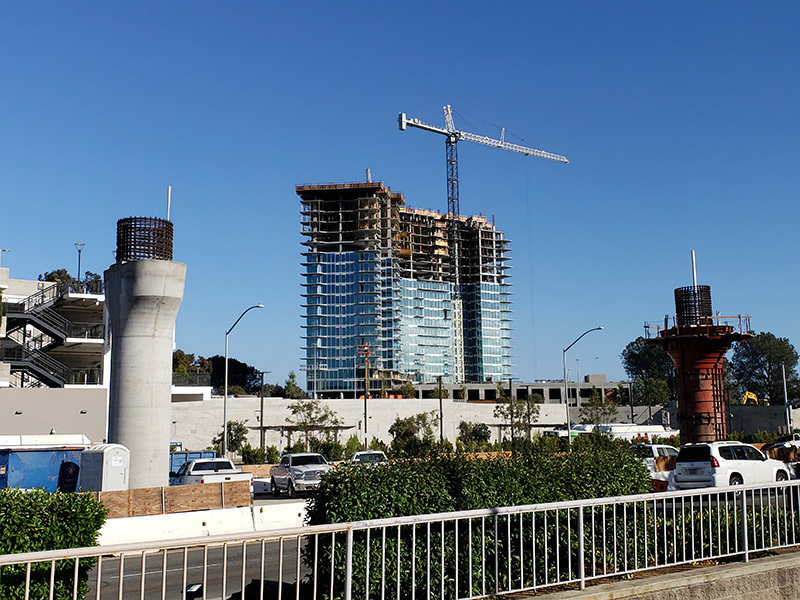 Construction on the pedestrian and bike bridge started in October on the south side of the canyon by the UC San Diego Mesa graduate housing buildings and will progress to the north side of the canyon. This bridge will provide a much-needed connection between Mesa Housing and the Medical Center, while also encouraging walking and biking with significantly shorter, safer routes to campus. The bridge will span 465 linear feet and will feature a 10-foot-wide bike lane and a separate 6-foot-wide pedestrian walkway. The northwest end of the bridge will tie into the existing sidewalk at Medical Center Drive, providing direct connectivity to the new Gilman Drive Bridge. Construction continues on the 23-story residential tower at Nobel Drive and Genesee Avenue. The last major concrete pour occurred in October and street work surrounding the tower will occur periodically over the next few months. Street work continues in the area surrounding the Westfield residential tower. Staging Area: A construction staging area is a physical location used for the storage of construction related equipment and materials such as vehicles and stockpiles. For example, a crane to lift the girders is being staged in the median along Genesee Ave.
Pre-cast girders, which are large beams used to support the Trolley bridge, are being placed on top of the columns to build the viaduct, the structure that will carry the Trolley along its alignment. 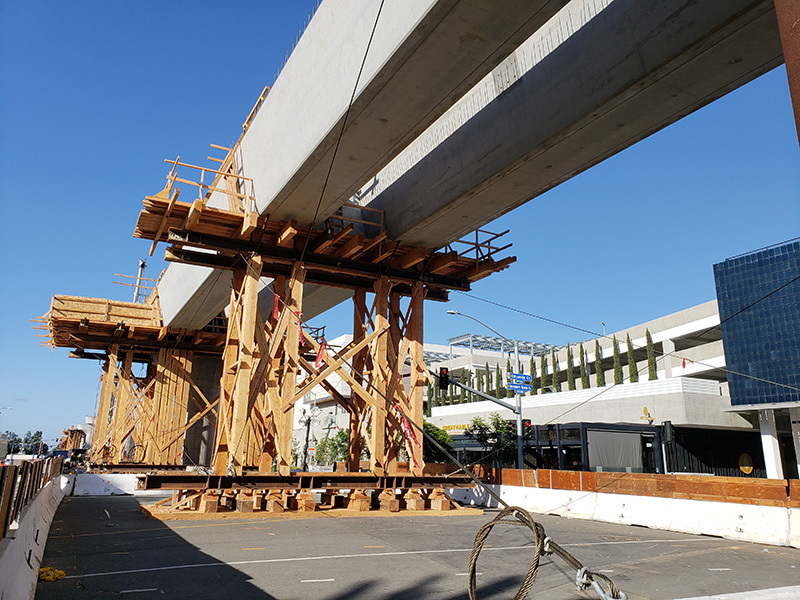 Work for the Mid-Coast Trolley girders along Genesee Avenue began this month and will continue through the fall for the remaining intersections at La Jolla Village Drive, Esplanade Court, the UTC Transit Center and Eastgate Mall. Due to the complexity of the work, closures can be postponed at any time without notice. View closure updates atKeepSanDiegomMoving.com/MidCoastTrolley,Facebook.com/MidCoastTrolley, or@ShiftSanDiegoon Twitter. Mid-Coast Trolley construction map and timeline as of September 2018. 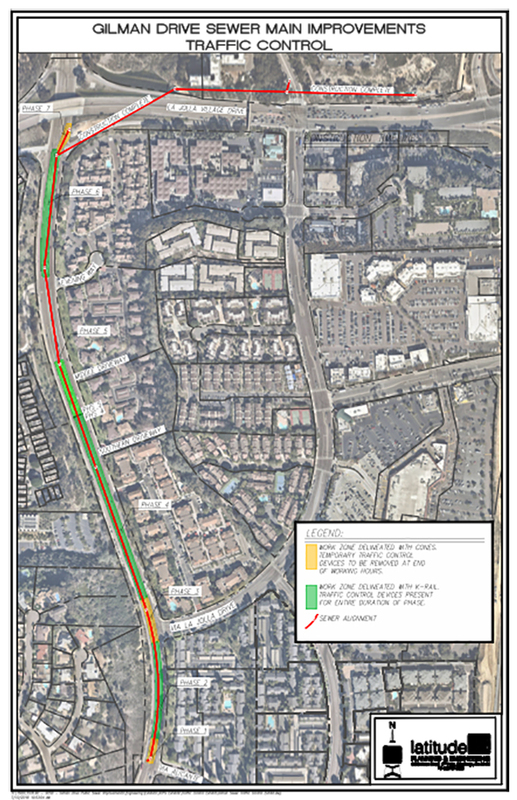 Crews began restriping lanes on La Jolla Village Drive in early September between Costa Verde Boulevard and Executive Way, reducing the number of east and westbound lanes. This work is required in order to complete the Trolley bridge construction. The lane reduction will be in place 24 hours a day and is anticipated to be in place through mid-to late 2019. Falsework, the temporary support structures used during construction, for the Gilman Drive bridge is tentatively planned for complete removal by the end of October 2018. This effort will reveal the bridge’s form for the first time since work began in November 2016. Visit KeepSanDiegoMoving.com/GilmanDrive to learn more about the Gilman Drive bridge project. The most recent phase of the project, Phase 4, began this month on Gilman Drive between Via La Jolla Drive and the middle driveway of the La Jolla Terrace community south of Evening Way. K-rail was been placed to separate the work equipment storage area from commuting traffic. Phase 5 construction moving northward is anticipated to start mid- to late October, and continued impacts are expected until November 2018. Gilman Drive Public Sewer Improvement construction map and timeline as of September 2018. The Torrey Pines Slope Stabilization Project is nearing completion. 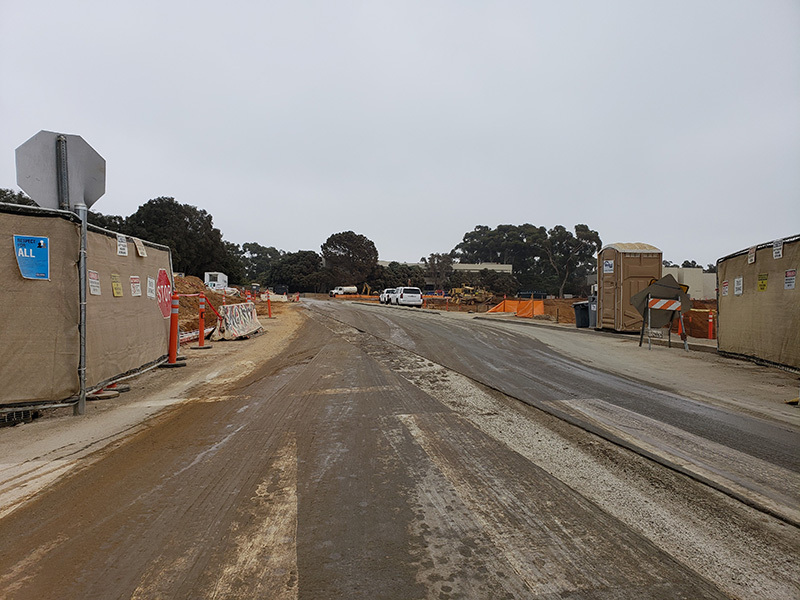 The final work includes connection of the newly installed water line to the existing main line on Torrey Pines Road, installation of soil nails into the retaining wall, the repaving and striping on Torrey Pines Road, and stamped asphalt work on the median. Some of this work will require lane closures; however, there will be available lanes in each direction during the project. We’re excited to share updates on some of the major projects that will bring access to new community amenities and resources in your neighborhood. Please note, construction schedules are subject to change. To confirm the below and other work schedules, contact Shift at 1-844-SHIFT-SD. GIRDER:A girder is a large iron or steel beam or compound structure used for building bridges and the framework of large buildings. Pre-cast girders, which are large beams used to support the Trolley bridge, will be placed on top of the columns to build the viaduct, the bridge structure that will carry the Trolley along its alignment. 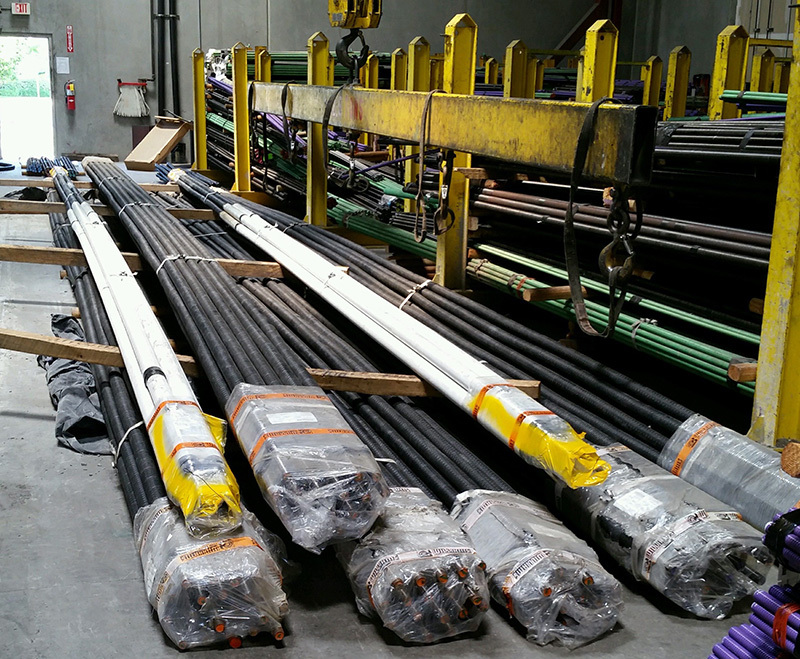 The girders along the Mid-Coast Trolley project are being installed from August to October. Column work for the section of the viaduct from La Jolla Village Drive to Regents Road on Genesee Avenue is complete. Work for the installation of girders will begin in late August and will tentatively continue through October 2018. 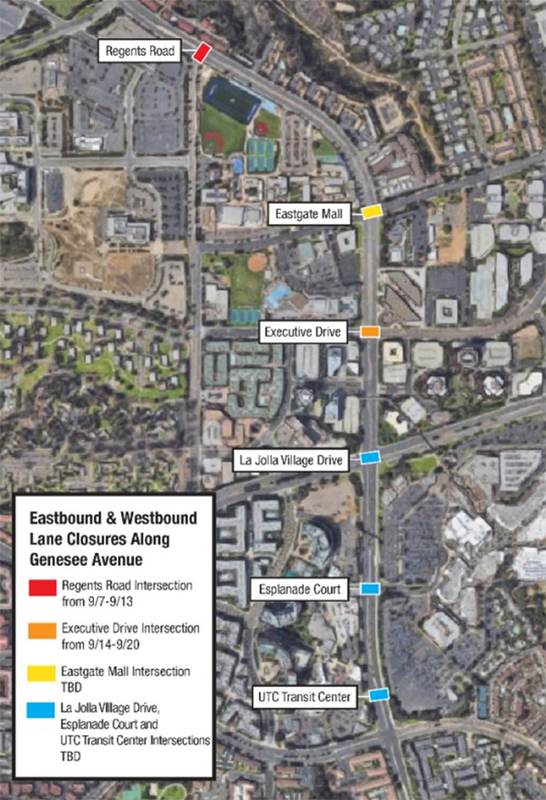 This construction will require closures of east and westbound traffic at six intersections, including Regents Road, Eastgate Mall, Executive Drive, La Jolla Village Drive, Esplanade Court and the UTC Transit Center. For more information, including upcoming traffic plans and detours, visit: KeepSanDiegoMoving.com/MidCoast. Work on the cut-and-cover tunnel at La Jolla Colony is anticipated to begin in late-September or early October. The traffic configuration on La Jolla Colony Drive for work on the cut-and-cover tunnel has been narrowed to two lanes, one lane in each direction. 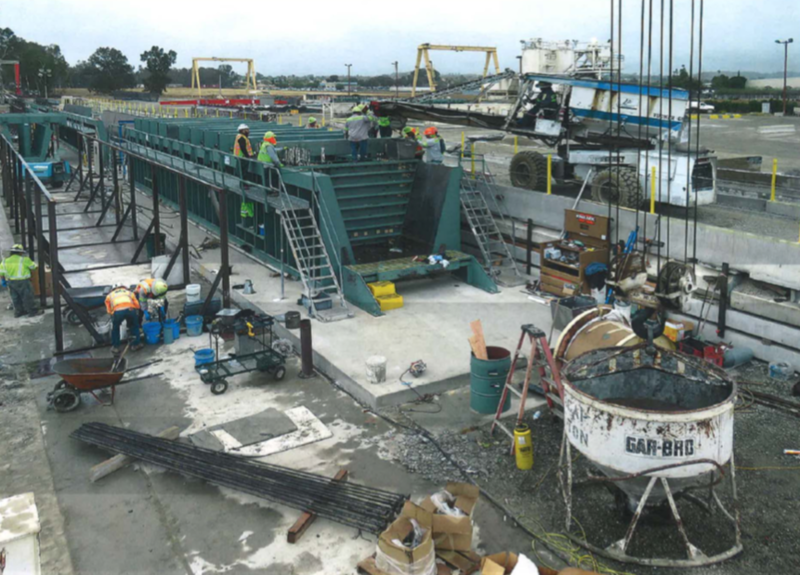 This configuration is in preparation for work to begin creating the tunnel and to allow for grading for the installation of a wall next to the tunnel. Follow @ShiftSanDiego on Twitter for the latest project updates and closure notices. For more information on the project, visit KeepSanDiegoMoving.com/MidCoast. The final pour of the bridge deck, the top surface of the bridge span, for the keyway as well as the side barriers has been completed. For the next phase of this project, falsework will be removed this month and will require additional temporary closures. Visit KeepSanDiegoMoving.com to learn more about the Gilman Drive Bridge project and sign up for the Shift newsletter at ShiftSanDiego.com to receive the most recent notices. Contractors are using the Torrey Pines Gilderport for parking during work hours from 7 a.m. to 3:30 p.m. through the remainder of the summer months. Signs will indicate the reserved parking for project personnel. Employees will be shuttled from the Gliderport to the project site. Commuters should anticipate potential delays in these areas and can plan an alternative route by visiting the interactive construction map at ShiftSanDiego.com.